Open your books and run your numbers as you try to keep up with the student loan debt crisis. A new generation creates a new financial crisis. College students use loans to pay for their education, but often times these loans are difficult, if not impossible to repay. This DVD dives deep in the college debt concerns and the inability of students to repay their debt. However, this does not stop lenders from lending- it helps them boost their profits. Watch interviews with students as they explain their personal debt crisis. Hear lenders speak about the business of students loans. School administrators also have a say about students loans and the effect they have on the education system. Also, view parents who have been through this situation with their children. 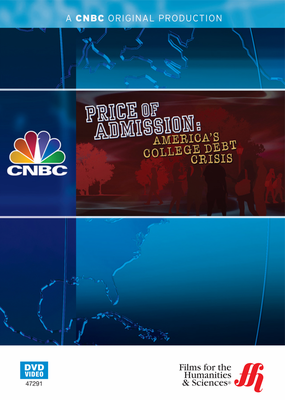 The video also shows an interview with the U.S. Secretary of Education's Arne Duncan to see this debt crisis from another perspective. Expand your knowledge of the reality behind students loans. Explore facts such as student loans cannot be charged off in a bankruptcy and even if the student passes away, the parents are still responsible for the debt. This debt keeps getting easier for students to attain as some companies put the loan onto a credit cart to be used for tuition and books. Some educational system try to guarantee jobs for their graduates, but often these jobs are not sufficient enough to support a family and begin to payback the loan. You also get a look into for-profit universities and how these systems use online courses as a main benefit of their programs.